One of my best childhood friends was born exactly one year and one day before me. We grew up across the street from each other and always celebrated each others' birthdays. As adults, we have continued to tradition of celebrating together -- meeting up for lunch sometime around our birthdays. A year ago, she and her husband and daughter moved out of state. 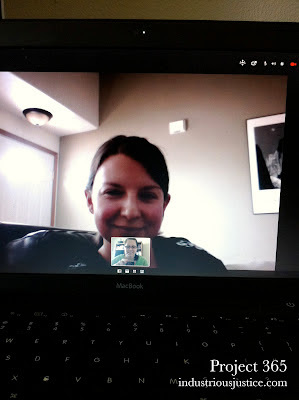 This year I decided that we should at least set up a Skype date to catch up and wish each other a happy birthday face-to-face. This was actually my first time using Skype. (I'm a little behind the times, I know.) We had a nice, long conversation and about halfway through I asked her if I could take a photo for my Project 365. Love! It was so great to chat with you yesterday on Skype, it was nice to be able to continue our tradition, with help of technology! We will have to set up more Skype dates!